Australian finger lime is a native of Australia. It grows wild in the wet sclerophyl forests in northern New South Wales and south eastern Queensland. Now it is being developed as an orchard fruit and is therefore reaching other parts of the world too. This fruit has a very wide genetic diversity in fruit size, colour, shape and even in fruiting season. 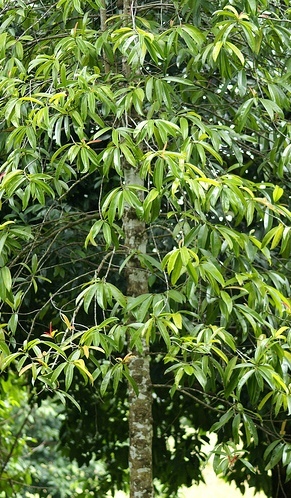 An evergreen tree, 2-7 m high. Leaves small, 1-6 cm long, 3-25 cm wide, glabrous, with a notched tip and crenate towards the apex. Flowers white, petals 6-9 mm long. Fruit cylindrical, 4-8 cm long, sometimes slightly curved, coming in many colours including pink and green, pulp colour varies from green, yellow, pink, light red through to deep magenta. 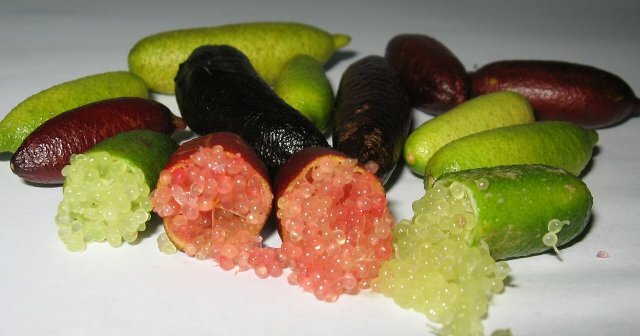 The globular vesicles of Australian finger lime fruits are used as a garnish and added to various recipes. These can also be eaten fresh and give the effect of burst of effervescent tangy burst on chewing. The juice can be used just like lime juice. Marmalades and pickles are also made from this fruit. 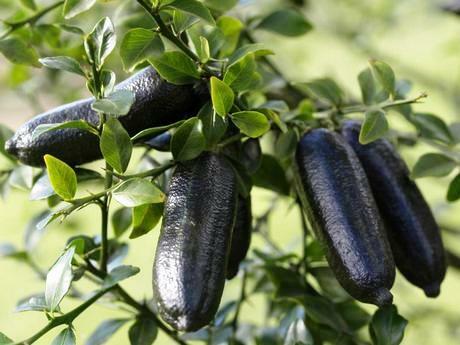 The peel of Australian finger fruits can be dried and used as a flavoring spice. Suggestions had been coming from Australian botanists since colonial times for the domestication of this fruit as an orchard fruit and serious efforts for this began in nineties. 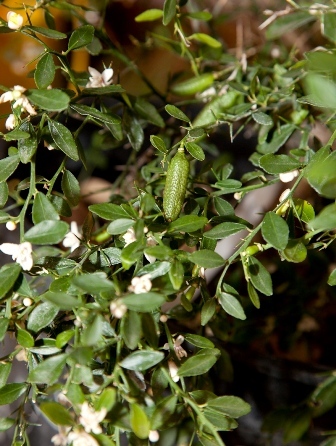 The demand for Australian finger lime is growing steadily every year and therefore its cultivation is picking up. In wild, the trees are sparsely foliated, slow growing and not good bearers. However, when cultivated and looked after well, these perform differently and become quite productive. Though the trees can grow on a wide variety of soil and climate, but the best results are obtained if the location is free from frost and the climate is also not very arid. Cultivation Australian finger lime plants do not require any special technology. These are grown like other citrus fruits. A quite wide range of varieties bearing fruits of different colours is available with nurseries. The CSIRO has also developed several Citrus hybrids by crossing the finger lime with standard Citrus species.